As new lingo springs up and grammatical errors persist, one magazine is battling to maintain linguistic standards. 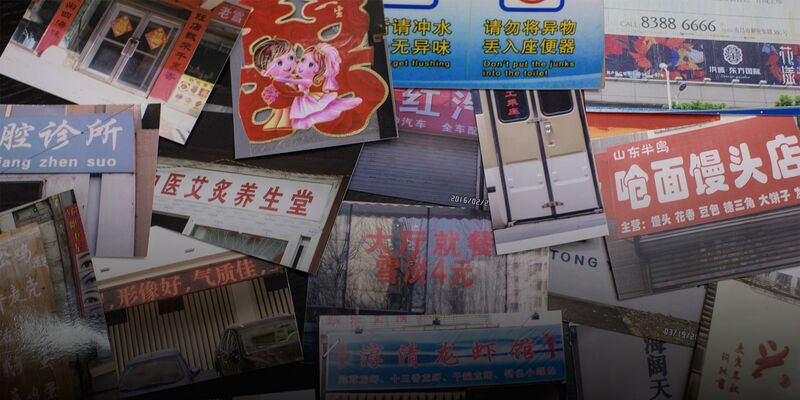 SHANGHAI — Each week, literary magazine Yaowen Jiaozi receives dozens of letters from fastidious readers pointing out linguistic faults in roadside billboards, popular television shows, and the works of acclaimed writers. But the nitpicking letters aren’t a nuisance to 30-year-old magazine editor Shi Junnan and her fellow staff members. Instead, the finicky notes are useful contributions to Yaowen Jiaozi, which is fighting to uphold Chinese linguistic standards in a world increasingly overrun by internet slang. Shanghai-based Yaowen Jiaozi — whose name literally translates as “biting phrases and chewing characters” — was established in 1995 and operates under the slogan: “Bite every mistake that deserves to be bitten, and chew every article worth chewing.” The monthly magazine’s mission is to attack every grammatical error it encounters — and the staff take the job seriously. Over the past 20 years, the magazine has amassed a long list of mistakes, from a nearly unnoticeable Chinese character error on a chopstick wrapper, to a series of mistakes author and Nobel laureate Mo Yan made in his award-winning works. The internet enables the average person to voice their opinions online, which has led to the prosperity of language and a burst of linguistic creativity. 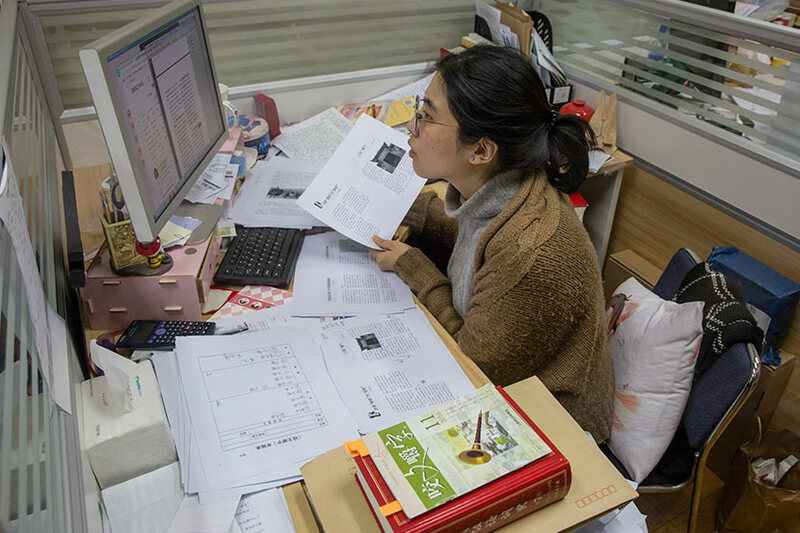 From their office in a protected historic building in Shanghai’s former French Concession area, Shi and the three other editors dutifully read through readers’ letters and work on the next issue’s content, which includes in-depth academic features about history and linguistics, images featuring linguistic mistakes so readers can test their own error-spotting abilities, and grammatical gaffes. Many errors are sent in by loyal subscribers, some of whom choose to pen their gripes on yellowed sheets of paper rather than sending an email or a message on social media. Throughout the magazine’s 23-year history, it has become clear that no one is exempt from criticism. Between 2000 and 2008, Yaowen Jiaozi slowly rose to fame by “biting” well-known individuals and groups. 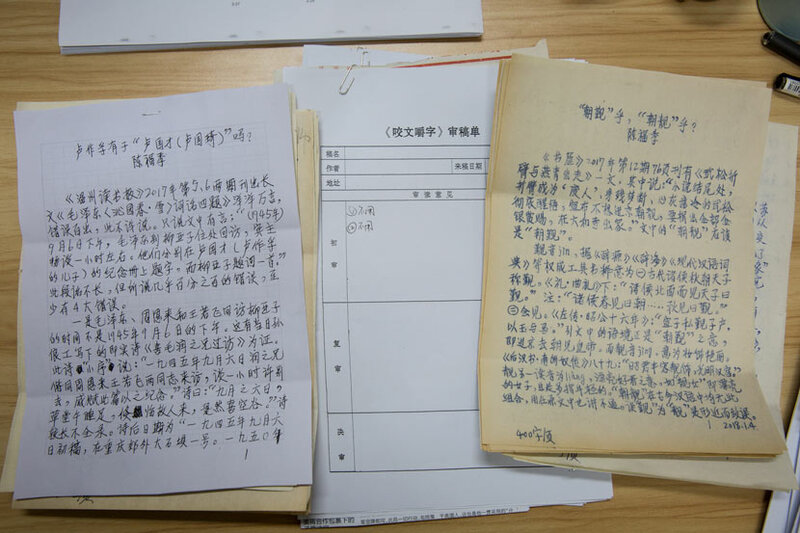 In 2000, it targeted 12 acclaimed authors including Wang Meng, who served as the country’s Minister of Culture from 1986 to 1989, before moving on to entertainers, influential bloggers, newspapers, and publishing houses. In 2012, the magazine picked its biggest target yet: the winners of China’s most prestigious literary honor, the Mao Dun Literature Prize. The magazine gave authors advance warning before trawling through their award-winning works. 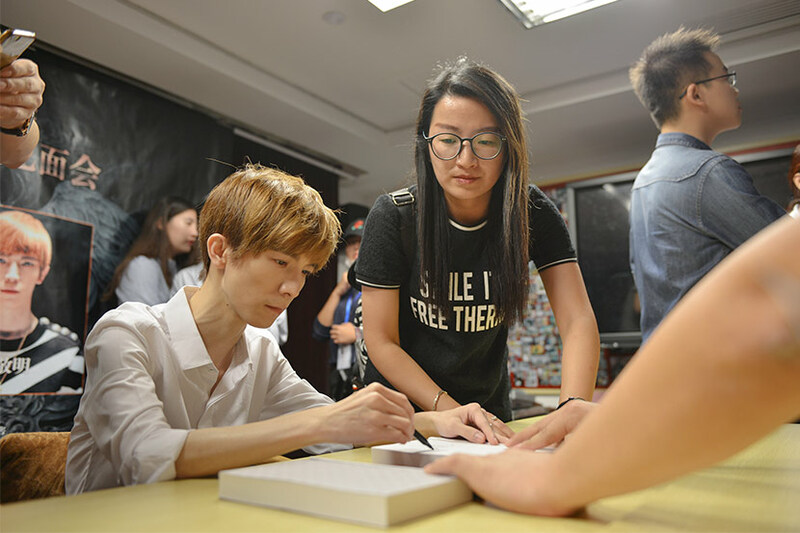 Most writers who were ultimately called out didn’t hold a grudge; instead, they welcomed the corrections, Yaowen Jiaozi Editor-in-Chief Huang Anjing tells Sixth Tone. “They want their texts to be as perfect as possible, so [flawless] works can be passed down through generations,” he says. While digital media increasingly threatens print publications, the 50-page magazine full of niche subject matter has so far managed to dodge the threat from online peers. 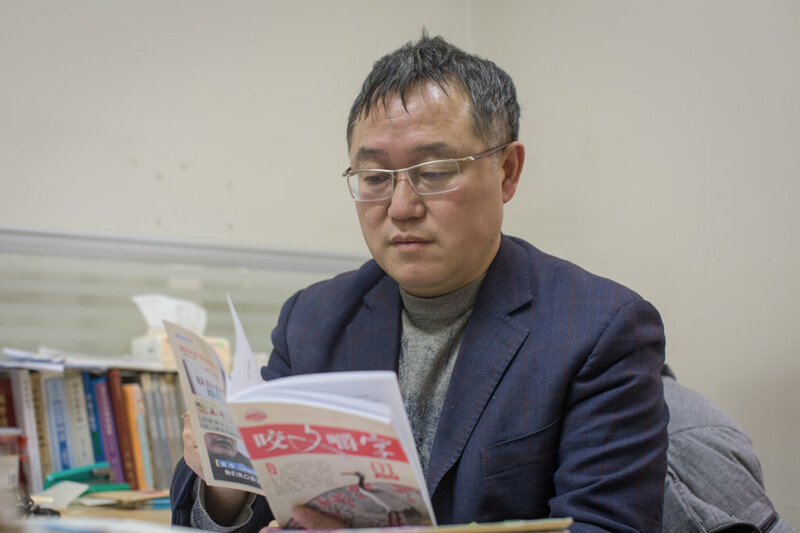 In recent years, it has maintained a steady subscription number of 200,000 readers who pay 60 yuan ($9) a year, many of whom work as editors or journalists themselves, according to 48-year-old Huang. Huang had to compete with 300 applicants to score his junior editor position at the magazine in 1999. 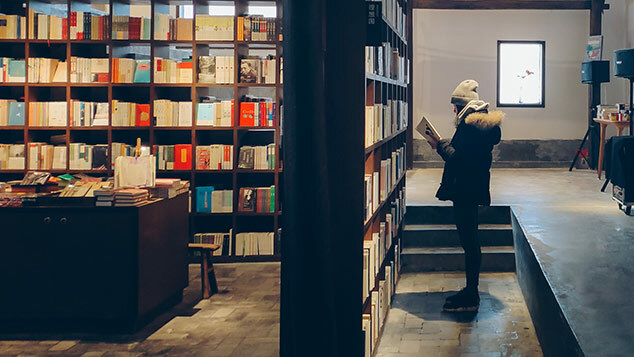 Then a 30-year-old with a master’s degree in classical Chinese literature, Huang recalls that print publishing was seen as a booming industry, although the newly established magazine only sold around 20,000 issues per month. But the decline of print has posed a challenge for hiring: Nowadays, many of the most promising young talents would rather become middle school teachers with the guarantee of a stable career, rather than magazine editors, Huang says. Despite its specialized subject matter, the magazine attracts widespread attention for its annual “top 10” lists on new slang and linguistic errors; the latter is published with financial support from the State Language Commission. The inaugural list of errors in 2006 included a mistake media often made when covering the launch of the Shenzhou 6 spacecraft, China’s second human-crewed spaceflight. Chinese news outlets often stumbled over two homophones for shenzhou that use different characters, mistakenly writing the characters for “sacred continent” — an ancient name for China — instead of the correct characters, which mean “divine ship.” Reporters might have been red-faced at the time, but Huang believes that pointing it out reduced the number of mistakes in news reports. In an attempt to embrace the internet era, Yaowen Jiaozi created another tradition in 2007: An annual list of top 10 buzzwords and slang terms. Huang believes there’s never been a period in history that’s witnessed the birth of so many new words. While some internet slang clashes with traditional principles of grammar, in general, Huang think the internet has had a positive influence on the Chinese language. “The internet enables the average person to voice their opinions online, which has led to the prosperity of language and a burst of linguistic creativity,” he says. The two lists make headlines upon their release each year. Despite their overall popularity, the lists themselves sometimes attract criticism. Last month, when editor Shi Junnan shared the list of linguistic errors on popular social media app WeChat, her friend commented: “Boring.” Shi says she had to suppress her impulse to block the friend for disrespecting her time-consuming efforts. A typical workday for Shi involves meticulous editing — every article in each 50,000-word issue must be proofread 10 times before publication. “This is not a financially rewarding job,” Shi says, “but it is meaningful and brings me a sense of achievement.” She adds that the magazine has a worthy purpose: to promote standardized language use and help people express themselves more accurately. Some netizens have questioned the very purpose of the magazine. “The point of language is to communicate, so do we really need to take one or two characters so seriously?” one web user asked on China’s Quora-like platform Zhihu, suggesting that the magazine was too literal in its approach to the Chinese language. The faceoff dates back to 2005, when the magazine wrote to the production crew of the immensely popular Spring Festival television program from state broadcaster CCTV, warning them to keep an eye on their language. 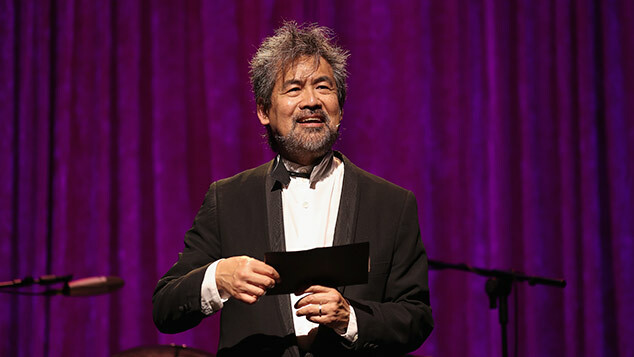 In 2006, the magazine noted 28 errors during the production, and two of the magazine’s editors were invited to supervise the following year’s gala. Picking faults with the gala became an annual tradition. 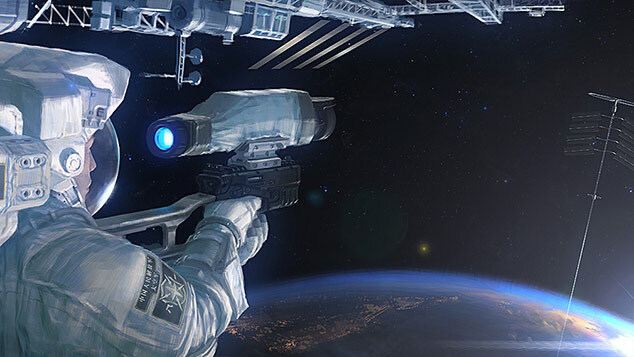 In 2014, the magazine flagged an inaccuracy in a promotional video for the show, which said the time span between two annual galas was 365 days. Magazine editors pointed out that the Spring Festival moved with the lunar calendar, but the 365-day calculation was based on the solar calendar. It wasn’t enough to worry the audience, however, with many netizens saying the magazine had gone too far. In 2012, the monthly magazine launched a campaign targeting 12 famous bloggers, including both rising literary stars and well-established scholars. At the end of that year, the magazine charted the bloggers’ error rates. Guo Jingming, a popular celebrity and the author of several best-sellers, ranked at the bottom, with an average of 21 mistakes out of every 10,000 words. Han Han, one of the most influential people in the world in 2010 according to Time magazine, received the second-worst ranking. In 2015, the People’s Bank of China, the country’s central bank, issued a new version of its 100-yuan banknote. Unfortunately, the note included a typo: According to the magazine’s then-editor-in-chief, the bank had used an old-fashioned character for the word yuan — a homophone meaning “round” that had been used in the past to denote the currency unit. Banknotes featuring the error are still in circulation, as the bank said its so-called mistake was common practice. In 2013, the magazine had a run-in with a TV program produced by CCTV over how to correctly write the name of a type of fungus. In the TV program — which often received praise for promoting correct word use — contestants were tested on their knowledge of Chinese characters. One contestant spelled the fungus name using the character component mu, which often appears in characters related to trees and plants. That contestant was crowned the champion, but editors of the magazine argued that the correct answer should use a different component, tu, which is related to dirt and earth. The word remains divisive: A widely used dictionary backed the magazine, but most Chinese Pinyin software only allows users to type the alternative version. After Donald Trump won the American presidential election in 2016, Chinese media struggled to get their story straight. Was Trump the 45th or 58th president of the United States? In fact, Chinese reporters had mixed up two concepts: Trump had won the 58th presidential election, making him the 45th U.S. president, as some presidents won more than one election. In Chinese media, the mix-up stemmed from confusion over two measure words, one for elections and the other for presidents. The mistake made Yaowen Jiaozi’s 2016 errors list.